The Bruery started their 12 Days of Christmas series in 2008 and each year a unique beer is being released for the next verse in the song. Some of the beers are inspired by their corresponding verse and all are designed to be capable of aging until the final 12 Drummers Drumming is released in 2020. The Partridge In A Pear Tree, was a Belgian Dark Strong Ale. 2 Turtle Doves was brewed with cocoa nibs, toasted pecans and caramelized sugar as the beer was based on the "Turtles" candy, resulting in cross between a Belgian Dark Strong Ale and an Imperial Porter. 3 French Hens was a spicy Belgian Dark Strong with 25% of it aged in French oak. 4 Calling Birds is a traditional Winter Warmer (not a lot of inspiration from calling birds) and 5 Golden Rings was appropriately brewed as a Golden Ale. Unfortunately, I missed out on the Partridge in a Pear Tree, but I have tried the subsequent releases and now have bottles in my cellar of verses 3 through 6. 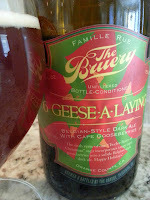 The 6 Geese-A-Laying is a Belgian Dark Strong Ale brewed with Gooseberries. It poured a deep amber colour with a light fluffy head. Sweet malts, Belgian yeast with a little fruitiness in the aroma. It started out mildly sweet with caramel, toffee and candied fruit flavours. However, that sweetness gave way to a tart and slightly acid fruity finish. And the more the beer warmed, the more the tart berry flavour came out and lingered after each sip. For being a big 11.5% ABV, the alcohol was not very noticeable, but I could certainly feel it after finishing the bottle myself. It's definitely going to be interesting to see how all these beers ager over the next six years.